TICKETS: $40 ($35 for students and seniors), but tickets purchased by April 5, 2019 are $35 ($30 for students and seniors). Please visit harmonium.yapsody.com to purchase tickets. For assistance or more information, email manager@harmonium.org or call 973-538-6969. Professional parking shuttle service will be provided for various parking lots on the Delbarton campus. In celebration of Harmonium’s 40th anniversary, Artistic Director Dr. Anne J. Matlack leads the acclaimed 100-voice choral society in this rarely-performed work, making it a “can’t miss” event. 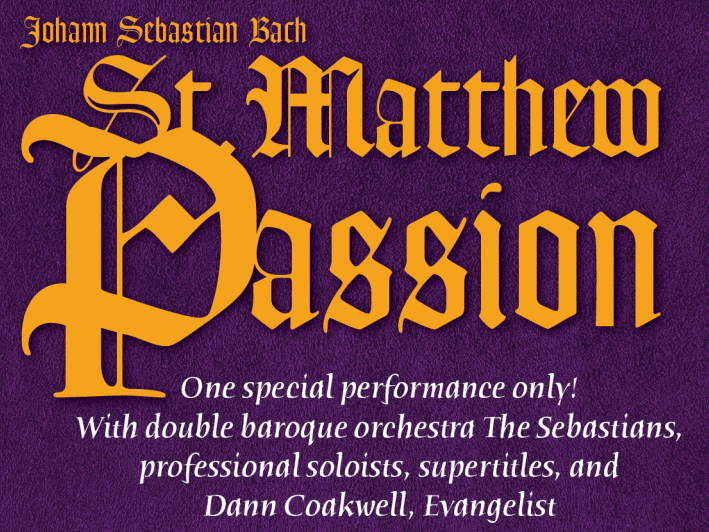 This gala production features the vibrant New York Times darlings The Sebastians as the double baroque orchestra, GRAMMY-winning Dann Coakwell as Evangelist, and members of the New Jersey Youth Chorus as the children’s choir. The performance also brings New York and New Jersey’s finest professional soloists to Morristown, including GRAMMY-nominated Stephen Sands (“a tenor with a focused, powerful tone” who sings with “subtlety” and “poignancy” – NY Times); award-winning musical theater and classical artist Michael Maliakel (“a baritone so tender your eyes well” – San Francisco Chronicle); Elena Bird (“…her clear soprano soared through the night air” – NJ Arts Maven); alto Patricia Ruggles (“her warm, luscious mezzo…carried the emotion of the text” – Classical NJ); and baritone Malcolm Merriweather as Jesus (described as “gripping” and compelling by Opera News). Sung in German, the performance will include supertitles of the English translation. Audience members are encouraged to buy tickets in advance and come early for what looks to be a sell-out performance in the beautiful acoustics of St. Mary’s Abbey.